My birthday present from my lovely sister Fizz was a tour of Brighton and bayside op shops with Melbourne Op Shop Tours. This tour was on a Friday rather than the usual Saturday, so Mr BG was very kind to take the day off to do the kinder/school run on my behalf. The company run tours of other areas of Melbourne, but this area interested me as I had never ventured into op shops in this neck of the woods (not that there are many woods in this part of Melbourne, but you know what I mean). In fact I had never ventured into this area of Melbourne at all during the time I lived there, so it was an adventure in itself travelling on the Sandringham line. 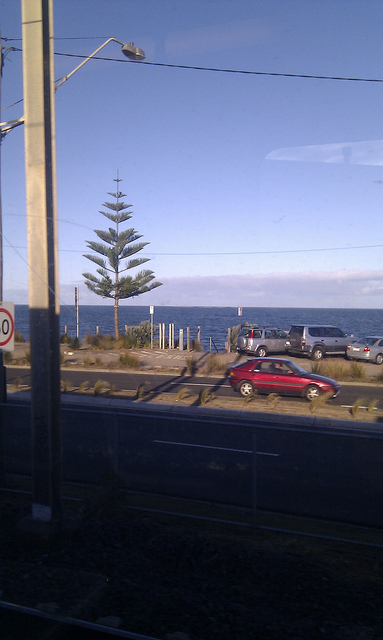 Port Philip Bay from the Sandringham train- a Beautiful sunny day! The tour guide was the very nice Erica, who blogs with Recycled Fashion and is very knowledgeable about all things oppy. There were 9 ladies in total on the tour, all with different stories and different reasons to shop. One lady was looking for wedding outfits, another was looking for vintage patterns. One lady picked up an amazing vintage print- the fact that she had to travel back to Perth with it was a minor consideration :). I think the buy of the day was a beautiful green coat with hood from the St Andrew’s Op Shop in Brighton for $20- so sad it wasn’t me who bought it! And on the way back to Hampton Station we also spotted a Red Cross shop. A couple of the ladies who served us in the shops were surprised that we were using public transport, and our waitress at our lunch stop was also very curious as to how we were getting about. In both cases they were very supportive of the whole enterprise. I didn’t go crazy- I bought a couple of tops for work, a tshirt and fleece for Mr BG, buttons for a cardigan, a book for mum and a hat (which proved to be too small). Some ladies were filling shopping trolleys with their purchases, but I am of the opinion that it is only a bargain if you need it. As Erica said in her blog There is a fine line between thrifting and hoarding. The best bit of the day was a day to myself, in Melbourne, in the sunshine, thanks to my lovely sister and lovely Mr BG. If you are interested in other op shopping tips and stores I op therefore I am is a great collaborative blog about Melbourne op shops, and there is also the Op Shop Guide which covers Victoria. sounds like the perfect way to spend a day-need to get my fix! I LOVE op-shopping and that will definitely do it when I visit Melb next time!!! Sounds like a fantastic way to spend a day 🙂 I had the previous edition of the Op Shop Guide Victoria, which I passed along to my sisters when I moved – it’s a great little book. The tour sound great. I cannot imagine life without op shopping. Potential tweet-up activity? most definitely a good tweet-up activity! It’s strange I found this website. A colleague of mine is also op shop fan and she told me her friend bought beautiful winter jackets for only $4. After patiently waiting for her to ask her friend who was in overseas, she finally got the information for me. Her friend picked up her jacket from op shops in Brighton for only $4. 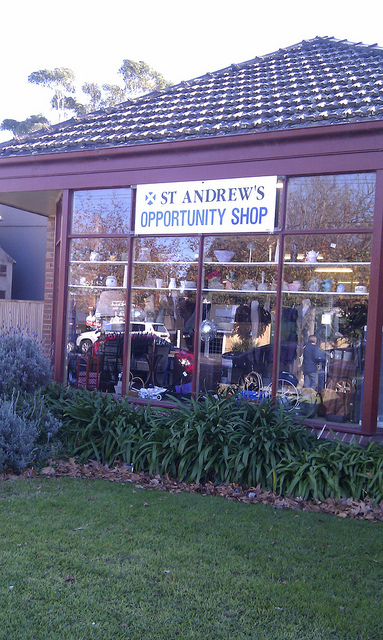 She said there is one op shop in St Andrews Church, and the other op shop at the other end of Church Street. So here I am, this morning I went to Biccy’s Op Shop in Brighton and I bought a 3 piece office suit Country Road 100% wool size 12 jacket, size 12 skirt and size 14 pants for only $10 and the colour is the beautiful light brown. I then went to St Andrew’s Op Shop in Brighton and found Jigsaw brand 100% wool office suit size 12 jacket and size 14 pants for only $12.That’s not all, I found Italian merino wool colouful geometric style jumper $12 in immaculate condition, Kamikaze lady like dark grey office jacket $7 (even the op shop manager was exclaiming she didn’t see this piece or else she would have bought it herself), polo long sleeve pure new wool jumper for only $4. How did I miss this blog post before 🙂 Thanks for the mention!